Today is the fourth anniversary of my becoming a full-time freelance writer. That’s right, on 1 April 2003 I stopped getting a regular salary and set about trying to earn dosh with the words I write. What more appropriate day than April Fool’s day? It was Scott who convinced me to do it. I thought he was mad. The next three years and a half years were filled with financial anxiety: loans were taken out, credit cards were juggled, and tonnes of panic was panicked. Two freelancers living together is not for the faint of heart. It’s not even a good idea for nerves of steel, lion-hearted types. I received my first freelance money—the advance on signing for the Magic or Madness trilogy—in December of 2003, which was eight months after I’d gone freelance. It was my first professional sale. The offer came in September so by publishing standards I was paid very quickly. But it was an awfully long time to be bringing in no money. In the meantime Scott signed up for two separate three-book deals (the Uglies trilogy and the three Razorbill books—So Yesterday, Peeps, and The Last Days) to keep us from going under. Problem was those books were on top of the Midnighters trilogy he’d already sold. Suddenly he was writing three books a year and experiencing the joys of shingles. All because I’d gone freelance prematurely. No. I’m proud of what I’ve achieved. 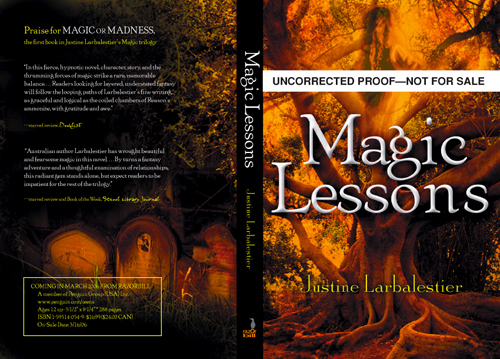 In my first four years of freelancing I’ve written four books, edited another one, and published four: the Magic or Madness trilogy and Daughters of Earth. I sold my first novel only five months after going freelance. Not bad, eh? Of course, I’d been trying to sell a novel since 1999, so it was four (almost five) years from first finished novel to first sold novel. And I’d been trying to sell short stories for much, much, much, much longer than that (way back into the eighties). I still haven’t had a pro sale for any of my short stories.1 And since I’ve pretty much stopped writing them, or sending them out, that’s unlikely to change any time soon. But if someone who’d never sold a novel asked me whether they should go freelance I would tell them no. No matter how talented or promising you are, going freelance without a single professional sale is madness. Perhaps you have a partner or a parent or a patron who’s willing to support you—it’s still dangerous and scary to try to make a living at something you’ve not proved yourself at. And there’s no guarantee that your partner or parent or patron will continue to support you. They might one day get jack of the whole thing. You might never make a single sale. Lots of extraordinarily talented people have failed to make a living as writers. I have no idea what the future will bring. I’ve seen too many writers with stalled careers after even the most brilliant of starts to be sanguine about my own. The young adult market is thriving right now and advances seem to be going up all the time, but who knows how long that will last? Yet despite the financial insecurity, the never knowing if my next book will sell or not, and the destruction of Scott’s health, these have been the best four years of my life. All the books I’ve published are the very best that I could make them at the time. There’s no book out there with my name on it that I’m ashamed of. Turns out that I love being a writer. It’s what I’ve always wanted, and now I have it, it’s better than I imagined. Fingers crossed that it lasts. Happy anniversary to me! And thank you, Scott, for everything. NOTE: I apologise for the complete absence of April First Foolery. Fortunately others in the blogosphere are more than making up for my seriousness. Now this is interesting, the comment thread on Tobias Buckell’s survey results has turned into a debate about the efficacy of writing short stories for learning how to write novels and for establising your reputation so that it’s easier to get your novels published. Given that I can’t write a decent short story to save my life and have sold three novels I don’t think short stories are necessary to build a career as a novelist. Short stories and novels are very different kinds of writing. Being good at one does not mean you’ll be good at the other. There are the folks who are genius short story writers whose novels are well, um, not anywhere near as good as their stories. Like I said, they’re different forms. On the other hand, I wrote hundreds of (broken, crappy) short stories before I wrote my first novel. Every one of those stories taught me something about writing. So as I began that first novel I’d already had a lot of practice writing dialogue, describing magical anvils, blowing monsters up. All of which came in very handy when I started writing the fictional form that I’m much better at. Then there’s the publishing side of things. Science fiction has long had a very strong and vibrant short story market. So many well-known sf writers started out publishing short stories: Asimov, Pohl, Silverberg, Russ, Delany, McIntyre etc. etc. So it used to be true that a great way to break into sf was to make a name for yourself as a short story writer. It’s not nearly as true as it used to be. Though if, say, Ted Chiang had a novel to sell I imagine the editors would be lining up around the block. Romance and young adult and crime and other genres do not have anywhere near the same kind of short story market so that path into publishing is not available. You want a name as a romance writer then you have to publish novels because there’s pretty much no one publishing romance short stories. So here are my questions: How many of you write both short stories and novels? How do you see the relationship between the two forms? Is one harder for you than the other? Or does it depend on the kind of story you’re telling? Do you read short stories as frequently as you read novels? First person is from the point of view of one person, up close and personal. The implied conceit is that the narrator is also the author of the novel. It’s all “I”, “me”, “mine”, “my” and “myself”. The vast majority of thinly disguised autobiographical novels set in coffee shops about aspiring novelists are in first person, making it the the pov par excellence for the self-obsessed. Many beginning writers find it the easiest because you can just write a novel as if you were you, and as you are you, what could be easier? All my first attempts at novel writing were in first person. Pros: The first person is very freeing. You can go off on tangents, share wild-and-woolly theories about life, the universe and everything. All that could possibly go on in your character’s brain is fair game. Cons: With first person you are stuck in one person’s head for fifty thousand plus words, which if you are the writer can mean many, many years of enforced visiting with a person you may grow to hate. This is especially bad if your text’s “I” is a thinly disguised version of yourself. But it’s not only writers who can hate first person. I have heard several readers say that it is their most despised point of view and that they won’t read books in it. Fashionability: Perennial. First person has been with us since novels were first writ and will never go away, but it’s like jeans they’re not exactly in fashion they’re just there. You are about to begin reading Italo Calvino’s new novel, If on a winter’s night a traveller. Relax. Concentrate. Dispel every other thought. Let the world around you fade. Best to close the door; the TV is always on in the next room. Second person is all “you” and “yours”. It’s the most maligned of the povs. And yet, when done well ’tis heavenly. Also very useful for delivering rules about writing. No wonder that it’s the first choice of advertisers and dictators. Pros: it’s an amazing device for writing about love and obsession and psychosis and tourism. Cons: It is like having to spend many hours in the room with a bossy, obsessive and possible pyscho telling you what you’ll think and what you’ll do. Bugger that! And when writing in second person there’s the worrying feeling that you’re starting to turn into a bossy obsessive psycho. Or possibly the voiceover of a tourism ad. Fashionability: Never high. The least popular of all the povs. Though some argue that all epistolary novels are automatically second person. Difficulty: Really High—bugger it up and you lose your readers instantly. A telephone was ringing in the darkness—a tinny, unfamiliar ring. He fumbled for the bedside lamp and turned it on. Squinting at his surroundings he saw a plush Renaissance bedroom with Louis XVI furniture, hand-frescoed walls, and a colossal mahogany four-poster bed. Third person is all “she”, “he”, “her”, “his”, “they” and “their”. Third person is the default pov for stories about someone else. Making it limited means that it echoes first person, making you privy to that character’s thoughts. Sometimes it feels like pretty much every novel in the English-speaking world is in third-person limited. Especially the really popular ones. Pros: It allows you to get into the head of a character without actually going all the way in. Although it echoes first a distance is maintained. Thus third person limited engenders a much less suffocating relationship with your characters. Cons: You can’t get as close as you can with first person. It’s much harder to go off on entertaining digressions. Scott’s So Yesterday would be an entirely different book if it was in limited third. Fashionability: The pov of choice of the twentieth century and shaping up to dominate the twenty-first as well. Difficulty: High, but at least you’ll look like all the other novels. It is a truth universally acknowledged, that a single man in possession of a good fortune, must be in want of a wife. However little known the feelings or views of such a man may be on his first entering a neighbourhood, this truth is so well fixed in the minds of the surrounding families, that he is considered as the rightful property of some one or other of their daughters. The point of view where the writer gets to be God. What is not to love? Pros: The narrator can go wherever they want whenever they want. They can deliver digressions. Tell us what’s going to happen and then tease us by not going there immediately. The narrator know what everyone is thinking, even the lad who got tuppence for watching the horses in a few lines in chapter five, “Of Horses and Other Follies Wherein We Learn that Our Heroine is Not All that She Seems”. Cons: When done poorly the reader has no idea whose head they’re in or why. Can sometimes read as cutesy or trying too hard to be like Jane Austen or Henry Fielding. Fashionability: The pov of choice of most of the eighteenth and nineteenth centuries. Difficulty: Extremely High, unless you were born in the 1700s, or really are God. Look at me! I have worked so hard that I’ve managed to get myself back on target for my Friday deadline! Yay me! And as a reward my tyrant husband is letting me have internet access this evening. How kind and good you are, dear sir. There’s been some lively debate over this way. I confess that I was surprised by the force of Garth (author and ex agent), Patrick (editor) and Sharyn‘s (editor) response to what I thought was an innocuous post (stupid me). Fortunately Teresa (editor) explained the reaction (thank you). In the end we all agreed: the writing is the most important part, as well as the second most important part, the third most, and so on. It is the day, the night, the morning, the evening; the dove, the crow, the sulphur-crested cockatoo, and every other bird in the sky, even the annoying myena bird. Why is the returns system still in place? Why does the wasteful stripping of paperbacks continue? Is the fantasy middle grade market really about to implode? Why is adult science fiction in such doldrums? Is it really? Why do UK publishers consider it natural for Australian & New Zealand rights to be tucked in with UK rights? Are they unaware that the British Empire is over? Do men really not read as much as women? Is this true everywhere? Or just in Australia and the USA? Why do so many people who don’t actually read want to be writers? Why does the best selling genre—romance—have the lowest average advances for its writers? I could go on. If you have any questions of your own add them to the comments thread. And if you have any answers, please, please, please tell all!